Honda has ensured that image is diminished by throwing in ample plastic cladding and a set of roof rails finished in silver. They have also sized up the wheels. WR-V runs on 195/60 R16 Eco tyres with diamond cut alloy wheels, which look quite similar to the what’s in a BR-V. At the rear, tail lamps have been extended to contribute to a change in the overall design. These extensions include new rear fog lamps, which are quite bright at night to be honest.There is a thicker plastic bumper and silver rear diffuser to create the true essence of a crossover. Suspension setup has been reconstructed to make space for longer suspension travel and higher ground clearance. Honda WR-V sits at 188mm off the ground. WR-V may not look very attractive on paper but it definitely wins over the war of cross hatchbacks when it comes to design. There are less significant changes in Honda WR-V in terms of interiors, over the Jazz that it is based on. Interior is themed in black plastic and black fabric with a few dashes of grey and silver in the corners and trims.Seats are well bolstered around the thighs and back and feel much more supportive for long drives this car is aiming to be used for. There is a central armrest for front row passengers with an openable cubby space, which can easily house a phone and sunglasses. Rear seats however are a surprise. They are flat and fixed and also have integrated headrests, which aren’t helpful for people who are about 6 feet tall. Rear seats are less supportive but cushioning is pretty soft. Leg room perhaps is the ultimate selling point for WR-V. With a standard driving position in the front seat, there’s space at the rear to stretch your legs or even accommodate a camping bag between the knees and front seat base. The infotainment system is a new upgraded Digipad recently seen in the all new Honda City. The infotainment system operates on new gen Navigation software, Apple Carplay and Android Auto. The touch screen has noticeable lag and it takes patience to get used to it on the move. Honda’s party trick in the WR-V is the installation of a one touch sunroof in the top end trim to add to overall opulence of the otherwise dark cabin.The top end diesel variant gets cruise control to adds to the convenience of long highway expeditions. 363 litres of boot space without the rear seats folded down is sufficient to carry large suitcases and an ice box for the weekend. 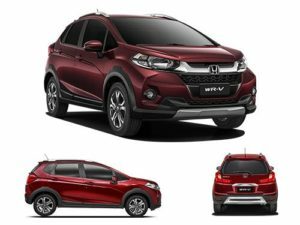 Honda WR-V offers excellent driving dynamics, ride comfort, enthusiastic driving and punchy engines. Both petrol and diesel engines are very responsive and the level of refinement is impressive even at high speeds. The transmission offers smooth shifts with evenly spaced-out ratios. Power delivery is quite linear with a strong mid-range and an impressive top end. The 1.2-litre petrol engine has good performance in the city as the autobox makes driving in stop-go traffic a breeze, though its low-end performance is not impressive when compared to the competition. The 1.5-litre diesel engine performs better on the highways as you can simply go down a gear or two to make quick overtakes, but it is not very good when it comes to noise, since in spite of improving the NVH characteristics of the car, the diesel motor is quite audible inside. If you are looking at getting yourself a Jazz, the WR-V deserves a closer look. It is definitely better suited to tackle our roads, and as such is more versatile than the Jazz. Just don’t expect the WR-V to tackle any serious mud plugging. However, the WR-V does offer more in terms of appeal and equipment. We expect the WR-V to be priced Rs 70,000 – Rs 1,00,000 over the Jazz, and that would well justify the extra kit and attitude that the WR-V has to offer. However, when compared to the more square and upright compact-SUVs in the market today, the WR-V’s appeal seems to dim. And, when you factor in the expected price, Honda’s WR-V ends up feeling like a bit of a hard sell.